Music is abundant in Zambia, it is part of everyday life. And this landlocked country contains many different cultures within its borders: this album merely touches on some of them. Zambia's musical diversity and richness is indeed a true natural resource, but to this day it is still underestimated and relatively unknown. We present here upbeat rural recordings with deep dance grooves, marvellous drumming, an old xylophone master, exquisite vocal harmonising, uplifting gospel music Zambian-style, the ancient kalumbu bow – a mixture of youth and tradition. No two ways about it, you will come away happier after hearing this wonderfully honest music! Total time: 68' 04". 20 page booklet. Tracklist: 1. Bantu Welesa Wesu, by Mansa Visual Art Band, 2. Kuli Shungu, by Mukuni Palace musicians, 3. Nipanike, by Ngoma Roots Band, 4. Ndakali Kwetwe, by Hachaanga Squad, 5. Ing'anda Yapoila, by Tusole Band, 6. Ino Ino, by Clement Moonga, 7. Tulumbe Mwami, by Enock Mbongwe Haciwa, 8. Saansa Cisanse, by Chris Haambwiila, 9. Kuomboka, by Crispin Mutanuka, 10. Chimondo, by Twatasha Dance Group, 11. Chibinda Wanama, by Twatasha Dance Group, 12. Twaile Kwamilambo Nemfumu, by Bwafya Cultural Troupe, 13. Yanchime Ngoma/Kumaala Yooyo, by Indigenous Ila Culture Association, 14. Ndayeya Mbwakeenda Taata, by Nambuka Chileka, 15. Taiyaka, by Ngoma Roots Band, 16. Palameni Mwebalecula, by Mazheri Singers, 17. Chiyongo Tabateba, by Mansa Visual Art Band. The video clip, made during the 2008 recording trip, shows some of the musics on this cd. Songlines 2013 (GB): "The perfect antidote for road rage. 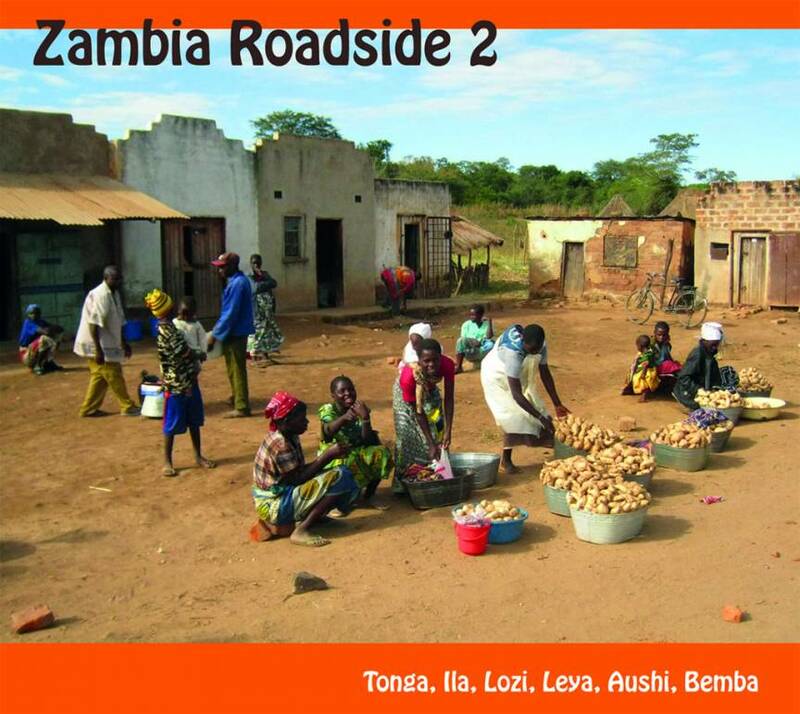 The populace's friendly outlook is reflected in the joyous and uplifting nature of ther songs presented on Zambia Roadside 2. 'You will come away happier after hearing this wonderfully honest music', promises the CD's cover. It's a promise that the music keeps." The Wire 2013 (GB): "There is a lot of fabulous drumming here, along with xylophone wizardry, virtuosity on the single-stringed kalumbu bow, gloriously harmonised Zambian gospel, and rowdy communal revelry. On a few tracks, sound quality is less than perfect, but minor imperfections detract little from the spontaneity and excitement of this music."